Primary care for pets has a bright future at the College of Veterinary Medicine at Kansas State University thanks to a generous sponsorship by Hill’s Pet Nutrition. With this gift - the largest corporate gift in our history – the veterinary college will renovate three strategic areas in Mosier Hall to provide approximately 16,000 square feet of new space dedicated for clinical training, classroom teaching and research. The Pet Health & Nutrition Center will be named in honor of Hill’s Pet Nutrition. Interim Dean Dr. Bonnie Rush meets with Drs. Jesper Nordengaard, Jolle Kirpensteijn and Omar Farias from Hill’s Pet Nutrition to thank them for lead gift supporting the creation of a new Pet Health & Nutrition Center at the Veterinary Health Center. Dr. Elizabeth Davis and Dr. Susan Nelson from the CVM join Emilie Fink, from the KSU Foundation, and Willie the Wildcat at Hill's Pet Nutrition headquarters in Topeka. Dr. Omar Farias, Dr. Jolle Kirpensteijn, Willie the Wildcat and Dr. Bonnie Rush celebrate the new gift. This renovation will create 3,400 square feet of space on the first floor of Mosier Hall for the new Hill’s Pet Health & Nutrition Center. This project will also allow the addition of 5,000 square feet research suite on the second floor. A 270-seat contemporary auditorium will be constructed in a new area of the complex. Additional benefits from the renovations, as detailed by Dr. Rush, include: provision of a comprehensive educational experience in small animal nutrition and communication with pet owners; expansion of wellness-training opportunities for students; additional space for routine procedures; better capabilities to serve the wellness needs of small animal clients; dedicated space for communication training and rounds; and dedicated space for nutritional displays and nutrition consultation. Happy Holidays to you and your family and a joyous New Year! From all of us at the Kansas State University College of Veterinary Medicine..
Veterinary experts at Kansas State University recently participated in projects in Paraguay and Argentina in an effort to initiate a three-way collaboration with two other universities toward the creation of a tick-borne disease research program; present research updates at an international conference; and promote a working relationship with a governmental agency in Paraguay. Meeting the associate dean of the FCV-UNA and other researchers. From left to right: Dr. Raquel Pedrozo, head of the Clinical Sciences Division, Department of Pathology and Clinics FCV –UNA; Suhasini Ganta, BSc, KSVDL; Dr. Roman Ganta,director of the Center of Excellence for Vector-Borne Diseases at K-State; Dr. Shyrley Paola Amarilla, head of the Anatomic Pathology Division, Department of Pathology and Clinics FCV-UNA; Dr. Carlos Ramon Chirife, associate dean FCV-UNA; Dr. Melinda Wilkerson, head St. George's University, Grenada, adjunct professor, K-State; Andrea Blair, MEd, director of student accessibility and accommodation service, St. George's University; Dr. Sandra Perez Macchi, Clinical Pathology Division, Department of Pathology and Clinics, FCV-UNA; Dr. Giselle Cino, pathologist at KSVDL; Dr. Liz Castro, Clinical Sciences Division - Department of Pathology and Clinics FCV -UNA. Dr. Giselle Cino meets with the current president of SENASCA, Dr. José Carlos Martin Camperchioli. The CVM team tours a lab at the Faculty of Veterinary Medicine of the National University of Asunción. Dr. Giselle Cino, a pathologist at the Kansas State Veterinary Diagnostic Laboratory, is helping facilitate the collaborative project through her connections in Paraguay. She earned her Doctor of Veterinary Medicine degree at the Faculty of Veterinary Medicine of the National University of Asunción (FCV-UNA). Her message emphasizes the prevention of the spread of ticks in pets. "The most dangerous outcome is when a single tick can carry more than one disease-causing agent, thus potentially infecting a wide range of animals, especially pets," Dr. Cino said. Dr. Melinda Wilkerson, department chair for pathobiology at St. George’s University (SGU), joined Drs. Ganta and Cino at the FCV-UNA main campus, in the city of San Lorenzo, Paraguay. Dr. Wilkerson was previously on the faculty at the K-State College of Veterinary Medicine. Drs. Cino, Ganta and Wilkerson met with the administration of the UNA and faculty. Further, the team gave research presentations on tick-borne diseases to the students and faculty at FCV-UNA. The team also discussed research collaborations at length with FCV-UNA and administrators. A three-university research collaboration to study ticks and tick-borne diseases of importance to agricultural and companion animals for South America, Caribbean and the USA is already initiated. As part of this collaboration, efforts are also underway in student and faculty exchanges to promote strategic interests of CEVBD at K-State, SGU and UNA. Dr. Cino also visited SENACSA, a government institution in Paraguay, and met with its current president, Dr. José Carlos Martin Camperchioli. SENACSA is in charge of regulation, coordination and execution of guidelines for the health and well-being of livestock and companion animals, as well as the quality of animal produce. It is similar to the USDA’s Animal and Plant Health Inspection Service (APHIS). At the meeting with Dr. Martin, the researchers discussed potential opportunities for collaboration, projects and exchange programs among SENASCA veterinarians and K-State faculty. SENACSA currently has biosecurity level NSB3A-NB4OIE research space, so opportunities for training and collaboration in foreign animal and transboundary diseases were also discussed in the meeting. Currently, Drs. Cino and Martin are working on establishing collaboration projects with USDA-APHIS in Plum Island. “This opportunity opens the door to train more faculty and students at KSU and Paraguay into foreign animal diseases detection, diagnostics, and biosecurity” Dr. Cino said. The Buenos Aires conference drew researchers from many countries and top universities and institutes from around the world and covered several topics of interest to SVM research, including vector-borne diseases and their vectors, chemotherapeutics and drug resistance, disease diagnostics and validation, immunology and immunity, one health topics related to human and animal health in various communities of the world and rural development, taxonomy and evolution, and training and capacity building. Dr. Steve Stockham, professor emeritus of veterinary clinical pathology in the College of Veterinary Medicine at Kansas State University, has been selected for a 2018 Lifetime Achievement Award from the American Society for Veterinary Clinical Pathology (ASCVP). Dr. Steve Stockham accepts the Lifetime Achievement Award from ASVCP President Dr. Lindsay Tomlinson. The award was presented at the society’s annual meeting Nov. 5 in Washington, D.C. Several past K-State clinical pathologists trained by Dr. Stockham attended the ceremony. Dr. Melinda Wilkerson, adjunct professor in the Department of Diagnostic Medicine/Pathobiology and current chair of pathobiology at St. George’s University in Grenada, nominated Dr. Stockham for the award. Dr. Wilkerson, who nominated Dr. Stockham, noted there were 10 current and former K-Staters at the ASCVP award ceremony to show their support, including Balaz Szladovits, Brad Galgut, Mehrdad Ameri, Rachael Holicky, Adi Wasserkrug Naor, Mark Morton, Yvonne Wikander. Overall Dr. Stockham has 38 years of teaching experience in the veterinary curriculum, with 31 years as a primary instructor and course coordinator. Most of his classroom teaching has been in veterinary clinical pathology courses in which he uses a combination of lectures, case-based discussions and on-line microscopy methods to engage students and promote learning. His instructional activities have led him to receive 25 teaching awards during the past 28 years, such as the prestigious Norden/Pfizer Distinguished Teaching Awards in 1987, 1998, 2012 and 2016; the Bayer Animal Health Teaching Excellence Award in 2005, 2009 and 2013; and the William T. Kemper Fellowship for Excellence in Teaching in 1994. Dr. Stockham received the 2015 ACVP Educator Award, and in 2016, the American Association of Veterinary Medical Colleges presented him with its Distinguished Teaching Award in Academic Veterinary Medicine. Dr. Stockham retired after 15 years of service to K-State in 2016. On Nov. 16, students from Kansas State University’s College of Veterinary Medicine traveled to Colorado State University to compete in the annual Intercollegiate Animal Welfare Assessment Contest. Under the guidance of Dr. Abbie Viscardi, research assistant professor in the Department of Anatomy and Physiology, students were able to take part in educational seminars, on-site assessments, networking events, computerized scenarios, oral presentations of assessments and an awards reception. K-State students (undergrads plus a veterinary student) group up for a photo-op in front of Colorado State University’s sign. Pictured from left to right: Po-Yu (Tony) Lai, Shumin Li, Jenna Brunkow, Lucy Markland, Cassandra Kroncke and Mark Jameson. First-year veterinary student Cassandra Kroncke places at the Highest Scoring Individual in the Live Assessment for Veterinary Division at the Animal Welfare Assessment Contest at Colorado State University. Well-known livstock behaviorist Dr, Temple Grandin takes a moment to visit with the CVM's Dr. Abbie Viscardi. According to its mission, the Animal Welfare Assessment Contest (AWJAC) aims to provide a unique educational experience while strengthening student vocabulary and reasoning skills. The competition teaches students to assess the welfare of animals in a variety of settings using science-based methods and reasoning. Students are given the opportunity to weigh evidence and present sound evaluations. This contest ensures that tomorrow's leaders in the animal industries develop strong communication skills and acquire enhanced knowledge of animal welfare. The contest is open to veterinary students, undergraduates and graduate students. A limited number of veterinarians also take part each year as non-competitive participants. Dr. Viscardi said K-State veterinary students held their own and represented the college well with their success throughout the two-day event. Temple Grandin, professor of animal science at Colorado State University, also attended the event. K-State students mentioned how excited they were to be able to chat with Temple, as she has been at the forefront of animal behavior studies in the livestock industry. A Kansas State University veterinary infectious disease researcher and a late biology professor have been named 2018 fellows of the American Association for the Advancement of Science, or AAAS. Drs. Jürgen Richt and James Guikema are among 416 fellows chosen this year. Election as a fellow is an honor bestowed upon association members by their peers. The association's fellowship program recognizes individuals whose efforts toward advancing science applications are deemed scientifically or socially distinguished. Dr. Richt, who is a Regents distinguished professor and director of the university's Center of Excellence for Emerging and Zoonotic Animal Diseases, or CEEZAD, was nominated on the basis of his distinguished research and advisory contributions to the field of zoonotic diseases, particularly for his pioneering role in the development of the One Health paradigm. 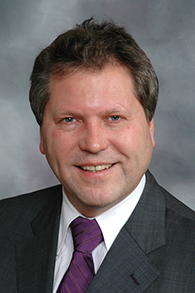 Dr. Guikema, late professor of biology and university administrator, was recognized for distinguished contributions to the fields of photosynthesis and gravitational biology, and in research administration at Kansas State University and the NASA Specialized Center of Research and Training, or NSCORT. This year's fellows were formally announced in the AAAS News and Notes section of the journal Science on Nov. 29. Drs. Richt and Guikema will be recognized at a certificate and pinning ceremony on Feb. 16, 2019, during the association's annual meeting in Washington, D.C.
Dr. Richt and Guikema join 21 current and emeritus Kansas State University faculty members who are fellows of the association. Dr. Richt is a veterinary microbiologist who has worked with multiple agents of zoonotic potential, including bovine spongiform encephalopathy or mad cow disease, chronic wasting disease, animal influenza viruses, Rift Valley Fever virus, Borna virus and other emerging pathogens. Dr. Richt's career, which includes a seven-year assignment as lead scientist at the U.S. Department of Agriculture's National Animal Disease Center, has been spent developing novel vaccines and testing methods and remedies for a number of animal and zoonotic diseases. Dr. Richt joined Kansas State University in 2008 as Regents distinguished professor and Kansas Bioscience eminent scholar in the College of Veterinary Medicine's department of diagnostic medicine and pathobiology. Richt became the director of the Department of Homeland Security's Center of Excellence for Emerging and Zoonotic Animal Diseases at Kansas State University in 2010. As director, he leads an international network for scientific research involving multiple U.S. universities, foreign universities, and various industry and foreign partners. Dr. Richt has authored or co-authored more than 200 peer-reviewed articles. His work has been published extensively, including in such prestigious journals as Nature Biotechnology, Science, Journal of Experimental Medicine, PNAS, Cell Host Microbe and Journal of Virology. In 2011, Dr. Richt received the Pfizer Animal Health Award for Research Excellence and in 2014 the Kansas State University Iman Outstanding Faculty Award for Research. Dr. Guikema devoted decades to Kansas State University as an administrator and professor of biology. He died in April 2018. Dr. Guikema joined the Division of Biology in 1981 and spent 37 years of teaching, research, service and administration at the university. He rose through the ranks to be named associate director of the Division of Biology. His research program in plant sciences transitioned into gravitational and space biology, with multiple experiments on the space shuttle. In 1998, Dr. Guikema became the university's associate dean of the graduate school and associate vice president for research. After 17 years, he returned to the Division of Biology to serve again as associate director. During his dedicated service in the university's central administration, he mentored students and young faculty and supported novel research and scholarly pursuits. Dr. Guikema received a bachelor's degree from Calvin College in Michigan and a doctorate in photosynthesis from the University of Michigan. He served a two-year postdoctoral position at the University of Missouri, where he met his wife of 31 years, Sue Brown, a Kansas State University distinguished professor of biology. An international partnership between Kansas State University and China is taking new steps forward to promote veterinary educational opportunities for Chinese students to attend college in the United States. A group of faculty members from Kansas State University recently attended the Veterinary Education Forum at Nanjing Agricultural University, held Oct. 20 in China, for K-State’s U.S.-China Joint Doctor of Veterinary Medicine (DVM) Program. Kansas State University’s Grant Chapman, associate provost for International Programs, and Dr. Du Yuanzhao, general manager/president of Yebio, sign a new memorandum of understanding to fund pre-veterinary tuition and activities for five students. Joining them are Dr. Harry Dickerson, associate dean for research, University of Georgia College of Veterinary Medicine; Dr. Jishu Shi, director of the U.S.-China Center for Animal Health, Kansas State University; Dr. Trevor Ames, dean, University of Minnesota College of Veterinary Medicine; Dr. Patrick Gorden, director of Food Supply Veterinary Medicine, Iowa State University College of Veterinary Medicine; Dong Wenchun, vice president, Nanjing Agricultural University ; Wang Ming, vice president, Chinese Veterinary Medical Association; Dr. Lei Wang, manager of the education programs for the U.S.-China Center, Kansas State University; Dr. Fan Gencheng, deputy general manager of Yebio; and Dr. Guo Xuan, director for research and development, Yebio. The K-State representatives included Grant Chapman, associate provost for International Programs; Dr. Jishu Shi, director of the U.S.-China Center for Animal Health; and Dr. Lei Wang, manager of the education programs for the U.S.-China Center. The conference was organized by the U.S.-China Center for Animal Health and Nanjing Agricultural University, and was sponsored by the Qingdao Yebio Bioengineering Company and Joint International Research Laboratory of Animal Health and Food Safety, China Ministry of Education. Representatives also attended the conference from schools that partner with Kansas State University in the U.S.-China Joint DVM Program: Dr. Trevor Ames, dean, University of Minnesota College of Veterinary Medicine; Dr. Patrick Gorden, director of Food Supply Veterinary Medicine, Iowa State University College of Veterinary Medicine; and Dr. Harry Dickerson, associate dean for research, University of Georgia College of Veterinary Medicine. The conference was attended by more than 100 people including deans of 14 Chinese veterinary schools, DVM graduates of the U.S.-China Joint DVM Program, senior executives of Yebio, and faculty and students of the Nanjing Agricultural University. The conference held separate morning and afternoon sessions, which were hosted respectively by Dr. Jiang Ping, dean, Nanjing Agricultural University College of Veterinary Medicine, and Dr. Wang Ming, vice president, Chinese Veterinary Medical Association. The morning session was highlighted by a signing ceremony for a new Memorandum of Understanding (MOU) for the U.S.-China Joint DVM Scholarship Program between Kansas State University and Qingdao Yebio. In this MOU, Qingdao Yebio will support the U.S.-China Joint DVM Scholarship Program by funding pre-veterinary tuition and activities for five students. The U.S.-China Joint DVM Scholarship Program provides for one year of pre-veterinary study at Kansas State University and four years of veterinary study at either K-State or at one of the four partnering schools: University of Minnesota, Iowa State University, University of Georgia and University of California, Davis. The program was initiated by the U.S.-China Center for Animal Health, China Agricultural University and Chinese Veterinary Medical Association, and has been financially sponsored by the China Scholarship Council, Kansas State University, Zoetis/the International Veterinary Collaboration for China and Banfield Pet Hospital. The U.S.-China Center for Animal Health has been leading the program since it was launched in 2012. “We value the partnership between the academic and industry, particularly in animal health field as a way serving the great society and the community,” Chapman said. The afternoon session at the conference featured presentations and discussions on how to efficiently use the U.S.-China Joint DVM Program to promote veterinary education reform in China. Dr. Wang Ming started the conference with a summary of Chinese veterinary education reform in last 10 years. Dr. Shi reported the history and development of the U.S.-China Joint DVM Program. Dr. Cao Shengbo, dean of the Huazhong Agricultural University College of Veterinary Medicine [that has recruited graduates of the joint DVM program Yi Ding and Yaoqin Shen as associate professors], talked about how to support and greatly make use of DVM graduates in advancing Chinese veterinary education. Dr. Ames presented curricular and educational innovations in U.S. veterinary medical training. The U.S.-China Joint DVM Program has graduated five DVMs since 2017. All of them have been recruited as associate professors at universities in China following their graduations in the U.S., which is unprecedented in China. The four DVM graduates of from the class of 2017 – Drs. Yaoqin Shen and Yi Ding, associate professors at Huanzhong University; and Drs. Jing Li and Bo Liu, associate professors at China Agricultural University – shared at the conference what they have learned in the U.S. and their teaching experiences in China. Following the conference, Dr. Shi and Dr. Wang interviewed applicants for the pre-veterinary program of the U.S.-China Joint DVM Program, along with Drs. Ames, Gorden and Dickerson. Four students have been selected to enter the program in fall 2019. Drs. Jishu Shi, Harry Dickerson, Grant Chapman, Patrick Gorden, Trevor Ames and Lei Wang celebrate the progress of the U.S.-China Joint DVM program. Congratulations to a trio of veterinary students on being chosen for prestigious scholarships. Overall, 22 scholarship winners for the 2018-19 school year were announced during the annual Kansas Livestock Association (KLA) Convention held Nov. 28 in Wichita. A total of $23,500 was presented by the Kansas Livestock Foundation (KLF) and its partners to both veterinary, pre-veterinary and animal science students. The American Association of Equine Practitioners (AAEP) also gave out scholarships recently. Jessie Schulteis, fourth-year veterinary student, Braxton Butler,second-year veterinary student (circled above), were among a group of students receiving scholarships at the KLA Convention. Among the KLA scholarship recipients were two veterinary students from K-State: Braxton Butler, second-year student from Virgil, Kansas, and Jessie Schulteis, fourth-year student from Lincoln, Kansas. Each received a $1,500 Cartridges for Cash (CFC) scholarship from Merck Animal Health and KLF. This award recognizes K-State veterinary school students with a career goal of being a large animal veterinarian. Kate Rigby, a fourth-year K-State veterinary student from San Diego, California, was one of five students selected nationally for a Merck Animal Health/AAEP Foundation scholarship. This $5,000 scholarship award recognizes promising veterinary students committed to a career in equine medicine. The scholarship was presented at the 2018 AAEP Convention, Dec. 3 in San Francisco, California. To be eligible for the Merck Animal Health/AAEP Foundation scholarship program, applicants must be second- or third-year veterinary students dedicated to equine medicine and active within any of the AAEP’s 39 student chapters at colleges of veterinary medicine in the U.S., Canada, Europe, and the Caribbean. The scholarships are awarded to students for their academic excellence, leadership in their school and AAEP student chapter, and their long-term goals. Fourth-year student Kate Rigby holds a big check for $5,000 representing a scholarship she received from Merck and the AAEP Foundation. A second year of K-State’s participation in an OIE Veterinary Twinning Project has just wrapped up. Dr. Tesfaalem Sebhatu, who helps coordinate the project, shared several highlights from the second year, including Workshop 5 that took place at the Sokoine University of Agriculture (SUA) in Morogoro, Tanzania, from Nov. 5-9, 2018. The CVM sent a group of six faculty members to SUA consisting of Dr. Peggy Schmidt, Dr. Kathryn Reif, Dr. Mike Sanderson, Dr. Raghavendra Amachawadi, Dr. Chuck Dodd and Dr. Sebhatu. Dr. Peggy Schmidt, Dr. Katie Reif, Dr. Tesfaalem Sebhatu, Dr. Raghu Amachawadi, Dr. Chuck Dodd and Dr. Mike Sanderson check in at the entrance to the College of Veterinary Medicine and Biomedical Sciences at Sokoine University of Agriculture in Morogoro, Tanzania. The objectives of the twinning project are to: Integrate SUA Veterinary Curriculum against the OIE Veterinary Education Model Core Curriculum; Advance high quality veterinary education by enhancing the Day 1 Competencies; Establish SUA as a regional center of excellence in veterinary education to support the National Veterinary Services; and Develop sustainable collaborative research and student/faculty exchange between SUA and K-State. Dr. Chuck Dodd tours the SUA dairy farm. The CVM team tours a facility (operated through APOPO) where rats are trained to detect mines. The rats are also trained to detect tuberculosis. The main outputs of Year 2 activities included reviewing the progress of project activities and workshop 1 and 2 action items including: curriculum mapping; needs assessment for a Continuing Professional Development (CPD) [editor’s note: CPD at SUA is analogous with continuing education] course for June 2019; student/faculty exchanges between K-State and SUA; joint research collaboration opportunities; and case presentations. Curriculum mapping has been performed so far by combining outputs of the results of stakeholder survey to identify areas for curriculum strengthening. The teams from K-State and SUA have performed gap analysis on results of curriculum mapping exercise and curriculum map version 2.0 data veracity, and gap analysis for each competency of curriculum mapping. Plans have been laid for the CPD course in June 2019. The OIE Twinning project will fund the course in for Tanzanian veterinarians to be held at SUA. The group looked at CE-needs assessment and selecting priority topics and developing CPD course, piloting online training materials at SUA with ISU, and identified animal species and course delivery methods for the CPD course, which will cover cattle and poultry. The course delivery method and topics will include face-to-face theory and practical in person course with wet lab which includes necropsy procedures and sampling. More information about the twinning project is posted online at: http://www.vet.k-state.edu/international/Initiatives/Twinning/twinning.html. The K-State team tours a Massai dairy farm. It's the time of year for holiday parties and large family gatherings, but while you might be looking forward to your favorite holiday dish or traditions, a Kansas State University veterinarian says some of them are dangerous to pets. Dr. Susan Nelson, clinical professor at the university's Veterinary Health Center, shares tips that could help you keep your pet from harm. Don't add stress. If your dog isn't much of a people person, an increase in parties and guests coming and going for the holidays can make them nervous or stressed. The best place for your pet is in a back room away from guests, Dr. Nelson said. You may need to speak with your veterinarian about anti-anxiety medications if your pet is extremely anxious this time of year. Remember as well that it is easy for a pet to slip through an open door when greeting a guest, and an escaped pet could become a lost pet. "This time of year there is a higher potential for pets to get lost if there is snow on the ground," Dr. Nelson said. "Snow covers familiar scents, making it hard for them to find their way home. Make sure your pet is also properly identified with a collar and tags and/or a microchip in case of an escape." Don't share food or drinks. You might be planning to indulge in some sweet treats and special meals at holiday parties, but there are some foods that should be off limits for your pet. "Alcohol, caffeinated beverages, yeast dough, and fatty, rich foods should be out of reach for pets," Nelson said. "Fatty foods, especially for dogs, can cause pancreatitis, which can be life-threatening. Bones also should not be offered as they can cause obstruction and perforation of the gastrointestinal tract." Other toxic treats to keep out of reach: chocolates; macadamia nuts; raisins; grapes; dips containing garlic, chives or onion; drinks and confections made with nutmeg; salty snacks; and sugar-free candies that contain xylitol. And don't forget to keep trash cans closed and food wrappers out of reach, as they are too tempting for pets to get into and ingest. "Remember to have guests put purses out of reach so your pets don't get into sugar-free gum, cigarettes or medications," Dr.Nelson said. Avoid a decoration disaster. Keep an eye on your pets around potentially hazardous decorations. Tinsel and ribbons, which are very tempting for cats, can be dangerous if ingested and can cause bunching up of the intestines, which can be fatal. Glass ornaments can break and cut pets' feet, and hooks used to hang ornaments can become problems in the gastrointestinal tract if swallowed. Be aware of any candles you have out, so pets don't knock them over and get burned or start a house fire. Light cords need to be out of reach for animals to prevent electrocution if chewed on, Dr. Nelson said. "It is important to keep liquid potpourri out of reach as it can be toxic for your pet if ingested," Dr. Nelson said. Reconsider decorating with your favorite holiday plants. "People often forget about seasonal plants and pets," Nelson said. "Holly and mistletoe are toxic if ingested, and all parts of lilies are toxic for cats. While not deadly, poinsettias can cause vomiting and diarrhea. Also, don't allow pets to drink the water from the base of live Christmas trees as water additives and chemicals from the tree can cause gastrointestinal distress and possibly death." Don't forget about gifts for the pets. "Giving gifts to the pets can be fun, but remember to keep food items hidden until the last minute," Nelson said. "Also keep food items that are gifts for your family out of reach so pets don't tear open packages. Your pet's exceptional sense of smell makes these items irresistible." After the presents are opened, keep an eye out for dangerous toy pieces such as small parts or balls. "These items can become foreign bodies if ingested, and batteries — especially if punctured from chewing — can cause burns in the mouth and gastrointestinal tract," Dr. Nelson said. Start the New Year off right. Dogs with noise phobias will be frightened during New Year's Eve parties — especially when it comes to poppers, noisemakers and fireworks. Additionally, cats will be attracted to string confetti, which if ingested, can cause a gastrointestinal obstruction. Dr. Nelson recommends keeping pets in a room where they are protected from loud noises, and talking with your veterinarian about medications for noise phobias, should your pet suffer from severe noise anxiety. The use of string confetti should be avoided, or if used, removed before your cat is allowed in the area. The Veterinary Medical Alumni Association organizes alumni receptions at several of the national annual conferences plus continuing education events and more. This month's section includes new about Dr. Dan Thomson, CVM faculty member, and Dr. Tera (Rooney) Barnhardt of Johnson, Kansas, and DVM class of 2014, who both recently completed a two-year continuing education program designed to enhance the business, communication, and planning skills of busy animal health professionals. Dr. Dan Thomson joins Dr. Tera Barnhardt upon receiving a certificate for completing the Executive Veterinary Program at the University of Illinois College of Veterinary Medicine. The certificate is presented above by Dr. Jim Lowe, EVP coordinator, and Dr. Peter Constable, dean at IU CVM. Dr. Thomson receives his EVP certificate. The Executive Veterinary Program (EVP), established by the University of Illinois College of Veterinary Medicine, has long been a premier credential for elite food animal practitioners. Dr. Thomson, the Jones Professor of Clinical Epidemiology, and Dr. Barnhardt, the coordinator of animal health and welfare at Cattle Empire LLC of Santana, Kansas, was among the first cohorts for the EVP in Beef Health Management, which united the expertise of the University of Illinois in post-graduate education with the expertise at Kansas State University in beef cattle production and health management. Drs. Thomson and Barnhardt completed the Executive Veterinary Program (EVP) with a focus on beef health management; this program consisted of 10 two-day interactive modules. The program covered essential aspects of beef production and health maintenance to enhance the management, consultation, and problem-solving skills faced by veterinarians in the field of beef medicine. There were 37 veterinarians from 16 states and Canada that completed the program with Dr. Barnhardt. The University of Illinois has been cultivating veterinary leaders and innovators in food production systems through the unique EVP model since 1991. The award-winning program uses nationally recognized experts from academia and industry to deliver practice relevant knowledge. Since the program began in 1991, there have been 255 graduates from seven EVP classes. The tentative date and times will be Jan 20, 2019 @ 7:00 pm - 9:00 pm in Orlando, Florida. Drs. Kate KuKanich and Brian Lubbers mentored Brianna Salgado through the McNair Scholars Summer Research Internship Program. Brianna presented at the One Health conference on Nov. 1. The presentation was, “Development of Kansas E. coli UTI Antibiograms to Improve Antimicrobial Stewardship in Companion Animal Medicine.” Brianna won the undergraduate poster award! Dr. Neala Boyer presented, “Thunderstorm and Noise Phobias and Separation Anxiety” for the Careers and Cases in Veterinary Medicine for the K-State Olathe lecture series on Nov. 7. Dr. Mike Apley presented, “Veterinarians and our Food Supply,” at the Careers and Cases in Veterinary Medicine for the K-State Olathe lecture series on Nov. 28. Drs. James Roush, Walter Renberg and former resident, Dr. Megan Wilson, published, “Comparison of the Effect of Dog, Surgeon and Surgical Procedure Variables on Improvement in Eight-Week Static Weight-Bearing following Tibial Plateau Levelling Osteotomy,” in the Veterinary and Comparative Orthopedics and Traumatology Journal. The Shelter Medicine program held its first symposium specifically targeted for veterinarians in shelter medicine. Individuals from six different organizations were in attendance: Kansas Humane Society, Helping Hands Humane Society, Humane Society of Greater Kansas City, Lawrence Humane Society, Nebraska Humane Society and Wayside Waifs. Drs. Brad Crauer and Alyssa Comroe presented lectures and provided round table discussions of attendee requested topics. They plan to host the second Shelter Medicine Symposium next year! Dr. Raghavendra Amachawadi was a contributing author of, “Effects of supplemental zinc sulfate on growth performance, carcass characteristics, and antimicrobial resistance in feedlot heifers” that was published in the Journal of Animal Science. Dr. Bonto Faburay has been appointed external examiner for graduate program by University of Pretoria, Department of Veterinary Tropical Diseases, Faculty of Veterinary Science, South Africa. Dr. Megan Niederwerder was an invited speaker and panelist at the National Institute for Animal Agriculture Antibiotic Symposium in Overland Park, Kansas. The title of her talk was "Role of the gut microbiome in reducing antimicrobial use in swine." Dr. Megan Niederwerder and Dr. Steve Dritz delivered presentations during the annual Kansas State University Swine Day on the risk of pathogens in feed. Dr. Niederwerder's talk was entitled "Risk of African swine fever virus (ASFV) introduction and transmission in feed." Dr. Ellyn Mulcahy, MPH program director and associate professor of Diagnostic Medicine/Pathobiology, attended and presented at the American Public Health Association 165th Annual Meeting and Exposition, Nov. 10-14 in San Diego, California, along with K-State MPH faculty members, Dr. A. Paige Adams, research assistant professor, K-State Olathe; Dr. Gina Besenyi, assistant professor, Department of Kinesiology, director, Physical Activity Research in Community Settings (PARCS) Laboratory; Dr. Erin Yelland, assistant professor and extension specialist, School of Family Studies and Human Services; and Daniel Winslow (MPH student in Physical Activity and Public Health). Daniel Winslow, K-State MPH student gave two oral presentations. Dr. Gina Besenyi, supervisor on both projects, is involved in the Physical Activity section as awards committee vice chair. Each year the physical activity section also awards a $750 scholarship to a student or early career professional to help offset the cost of attending the conference. To be eligible for any of these awards please check out the physical activity section at https://www.apha.org/apha-communities/member-sections/physical-activity/who-we-are/benefits. Congratulations to Tinisha Selvy, Veterinary Nurse with the VHC's radiology team, who graduated with a bachelor's degree in business administration on Dec. 8 from K-State Global Campus. She plans to apply for jobs on the big island of Hawaii. Good luck, Tinisha! Pet owners submitted pictures during football season through Oct. 28. K-State Athletics shared some of the pictures at home games on the jumbotron. Friends and fans were invited to vote for their favorite pet pictures on Facebook. The top 10 pictures receiving votes out of 431 entries were then judged by the VHC to select a grand prize winner, second, and third-place winner, with each receiving a gift basket from the VHC and special prizes for football or basketball tickets. Grand Prize goes to Bailey Ambrosier, Kansas City, Missouri, for her dog, Decker (left). Second place went to Eryn Raye Woofter, Shawnee Mission, Kansas, for her dog Lucky, middle. Third place went to John Cassida, Louisburg, Kansas. Dr. Tom Schwartz, director of the VHC, presents the grand prize gift basket to Bailey Ambrosier at the last football game of the season. The K-State MPH Program is accredited by the Council on Education for Public Health (CEPH). CEPH requests that commentary be submitted directly to their office to assure an opportunity for affected parties, including students, alumni, faculty and the practice community, provide written input into the deliberations of the site visit team. Doctoral student Ana Stoian presents her research on African Swine Fever at Research and the State held in Topeka. Research on weed control for food crops, early pancreatic cancer detection, threats to the biodiversity of tallgrass prairie ecosystem, animal feed biosecurity, and the social and economic impact of sustainable textile production are the focus of some of the winning research presentations by Kansas State University graduate students who were selected to represent the university at the 16th Capitol Graduate Research Summit, Feb. 26, 2019, at the State Capitol in Topeka. Ana Stoian, doctoral student in pathobiology, from Bucharest, Romania, presented her project "Survival of African swine fever virus (ASFV) in feed ingredients under transboundary shipping conditions." Her faculty mentor on the project is Dr. Megan Niederwerder and her major professor is Dr. Bob Rowland.